Ideas are easy. Pages are hard. Portland is finally getting autumnal weather, not a moment too soon for me. Fall has always been my favorite season. It also feels like the real beginning of the year–a legacy, perhaps, of the long summers when I waited impatiently for school to start. It’s a good time to assess what the year has brought so far, and to look at what’s ahead. Solar Eclipse: A month ago my partner Zachary and I saw our first total solar eclipse. We viewed it in a gorgeous garden just 40 miles from home, with good friends and perfect viewing conditions. Totality (1 minute, 57 seconds) was magical and went by in a flash. I am extremely happy to have had that experience. Domestic Affairs: Zachary retired last month. He’s thrilled about it. I’m happy for him, and glad we’ll be able to travel more. Still, it is an ongoing challenge for me to adapt to working–or just doing what I do on any given day–now that he’s home instead of at work. I’m grateful that we have a big house. We are out of each other’s way a lot of the time. Writing: Not long ago I turned in the revised ms. and 115 images for my YA adaptation of Charles Darwin’s On the Origin of Species. The ms. is being copyedited, so I haven’t yet seen the last of it–but almost. Atheneum, a Simon & Schuster imprint, will publish it next October. [Note: Photo research and permissions is a big job. Just imagine how tedious it was before everything was digital.] Meanwhile, I’m working on another YA adaptation, this one of Jill Jonnes’s terrific book Eiffel’s Tower. And I’ve written a book for young people about the history of the environmental movement from the 1960s to the present. Travel: Chile in November! We had such a great time in Argentina and Uruguay last year that we’re going back to South America for a couple of weeks, this time with our friends Fred and Ron. We’ll fly in and out of Puerto Montt, gateway to southern Chile’s volcano-fjord-and-lake country, and we’ll drive around visiting national parks and seeing penguins and other cool things. Also, I expect, sampling some of Chile’s excellent wines. I’ve been studying Spanish on Duolingo and will have a chance to put it to the test. (Fortunately, the Chileans are a kind and generous people.) I’ve also got trips scheduled to visit friends in South Dakota and Toronto, and I’m starting to look at prospects for next year. 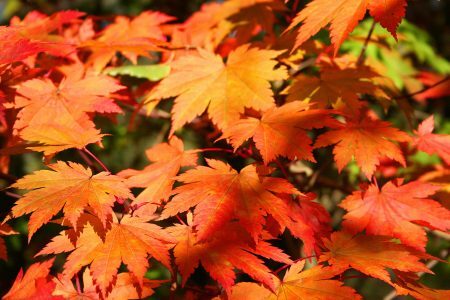 And now, those leaves won’t rake themselves . . . . This entry was posted in Darwin, Travel, Writing and tagged Darwin, Travel, Writing on September 20, 2017 by Rebecca Stefoff. It’s been a while since I’ve posted. I’ve been working on my YA adaptation of Darwin’s On the Origin of Species, a big project with many aspects (such as photo research and aquisition) that will continue to keep me busy for some time. I am thrilled with the editorial support I’ve gotten from Simon & Schuster and am excited about the book that my ms. is becoming. The Devil’s Detective, a novel by Simon Kurt Unsworth. I believe I was tipped to it by a post on the Lovecraft eZine Facebook page. It is dark (very), beautifully written, and deeply disturbing. I’m looking forward to the sequel, which I believe comes out this fall. Peter and the Starcatcher, a hilarious, bawdy play that unfolds Peter Pan’s origin story. It’s based on a book by Dave Barry and Ridley Pearson, but I didn’t know that until I saw the play. Lots of laughs and well worth seeing, if you get a chance. Green Room. Damn, what a movie. Unrelentingly violent, but compelling and very well acted. Patrick Stewart as the patriarch of a bunch of skinheads in the woods of southern Oregon will put Captain Picard waaaay out of mind. Imogen Poots inhabits her role with terrifying completeness. But Anton Yelchin, who died a few days ago in a tragic accident, gives the standout performance. The film stayed in my mind to such an extent that I had to watch the Goosebumps movie the next day to derail it. But I will see it again (Green Room, that is) one of these days. This entry was posted in Darwin, Movies, Reading, Theater, Writing and tagged Darwin, Movies, Reading, Theater, Writing on June 22, 2016 by Rebecca Stefoff. In recent years I’ve adapted some fascinating and important books into versions for young readers. I’ve had the privilege of working on two books by Charles C. Mann, whose articles and best-selling books on science and history have given us new ways to look at the events of hundreds of years ago. 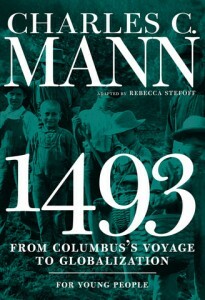 Seven Stor ies Press has just released my YA adaptation of his book 1493, which explores what happened to crops, climate, wildlife, and people when the first worldwide network of trade and travel got started in the sixteenth century. From Chinese pirates to South American freedom fighters to the man who convinced the king and queen of France to wear potato flowers, Mann’s book is filled with the stories of individuals who shaped and were shaped by history. This entry was posted in Writing and tagged 1493, Nonfiction, Writing on December 22, 2015 by Rebecca Stefoff. I’m happy to announce that several of my recent books have gone into new foreign editions. Here are a few of them: from left to right, the Chinese edition of The Young People’s History of the United States, my YA adaptation of Howard Zinn’s Young People’s History; the Azerbaijan edition of the Young People’s History; and the British edition of The Third Chimpanzee for Young People, my YA adaptation of Jared Diamond’s first book, The Third Chimpanzee. More to follow as I get hold of copies. This entry was posted in Jared Diamond, Publishing and tagged Publishing, Writing on September 25, 2014 by Rebecca Stefoff. You may have heard me grumble from time to time about “the tyranny of facts.” That’s because most of the books I’ve published have been nonfiction, often stuffed to the Plimsoll line with facts. (The Plimsoll line is the reference mark on a ship’s side that indicates the waterline at maximum allowable load. Thank Samuel Plimsoll, who pushed a law mandating such marks through Parliament in 1876. Fact.) Novelists, too, use facts to buttress their fictional constructions. Whether traditionally or independently published, every writer is sometimes responsible for researching and checking facts. I’ll share what I’ve learned from several decades of fact-wrangling in a presentation on “Being Your Own Fact-Checker: Tips and Methodologies for Research” at 9:45 on Saturday morning, February 1, as part of the first ever annual symposium organized by the Northwest Independent Writers Association. The symposium is a two-day event filled with sessions on writing, publishing, and marketing, as well as chances to network with other writers, both traditionally and independently published. I’m excited to be taking part in it, and I hope to see you there. This entry was posted in Appearances, Nonfiction, Publishing, Writing and tagged Nonfiction, Publishing, Writing on January 19, 2014 by Rebecca Stefoff. My Origin of Species adaptation is out!